When I think about it, it's pretty unusual for a British horror film to be released in America before all other territories. Still, I'm certainly not complaining. 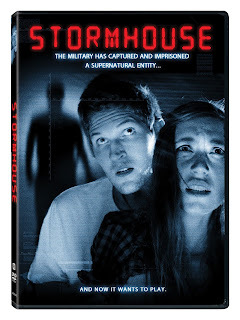 Yes, Lionsgate unleashes Stormhouse today in the good ol' USA, via the media of DVD, On Demand and Digital Download. I wrote and executive produced the film, while Dan Turner directed it and, like the fiend that he is, came up with the original idea: "The military capture a ghost". I'm as yet unsure as to the exact details of the second and third methods, I know that it's available for buy/rent Instant Download at Amazon.com, as well as on old-fangled DVD. And when it comes to physical media, I know it's for sale at Walmart, which makes me very happy indeed. Back through the mists of time, in the '90s, when I was hopping back and forth across the Atlantic as a journalist, I would love scouring US stores for hard-to-find VHS and DVD releases. So that makes this release even more special: the knowledge that our low-budget indie flick is nestling on those very shelves - probably somewhere between Dario Argento's The Stendhal Syndrome and excellent indie shocker Storm Warning. Stormhouse was shot in the wilds of Suffolk in August 2010. If you're intrigued by the story of the film's genesis, you might fancy reading an article I wrote for Issue Seven of the London Film 4 FrightFest's e-magazine, on page 18 here. UK release, you say? We have a distributor in place, and are just waiting to see when they plan to release. More news as it comes. As I don a party hat and ignite the party poppers, I'll leave you with Stormhouse's wondrous Lionsgate trailer (still love that Scary Narrator Voice), links to online interviews we've done to promote the film and links to places where you can follow/support the film's progress. God bless America. Congratulations, Jason. The premise sounds like something I'd be interested in seeing - I shall watch the trailer later when I can. Well done. Hope it does really well.